Views from the loch. : An attractive proposition! Photo 01 - Yesterday was a rather dismal day! Over the last few weeks I have encountered a good few anglers on the banks of the lochs and it must be said all of them were thoroughly decent chaps. They were the type of angler that we are keen to encourage, passionate about their sport and respectful of the property of others in effect anglers of the old school! Four of these anglers expressed a wish to join the club which is good but put me in a difficult position. For insurance purposes we are restricted to having up to 50 paying members and since we do not have an up to date database I really don’t know how many paying members we currently have. It would be foolhardy to go ahead and accept their applications in case it took our membership over the 50 mark. As most of you are aware insurance companies do not need much of an excuse to not pay out in the event of a claim so it would be unwise to tempt fate! Of course it is Mr Xxxxx who is making life difficult for us by not forwarding on this club property and I explained this to them and although they had read our news pages I was able to further inform them of his most curious actions. We came to an arrangement that their names would be on top of the waiting list come the New Year and they seemed happy enough with that. So why do they want to join? Well all of them have fished on and off for a few years and whilst enduring the mandatory blank sessions any time they caught they have found the fish to be in very good condition! They were also delighted to see that both the lochs were never deluged with the type of angler we dread, the Buckfast swilling chainsaw wielding yob with a rod as an afterthought! The serenity of the “silent loch” was just what they were looking for after a hard week at work. They were also delighted with how reasonable our prices were and the benefits of being a member were in their opinion very generous! 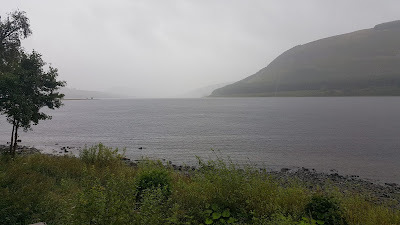 The size of the lochs also mean that it would take years to fish all the areas they would like to fish and never could they envisage a scenario where they could not find a space to fish! There is an inherent attraction at the lochs and many of our members mark it down as one of their favourite places to be! Rather interestingly the lads were approached by another of our permit sellers and it looks like we have significantly improved the checking of permits when compared to our previous situation with Mr Xxxxx! It’s not just about the fish, it’s the scenery, the wildlife and most of all to an angler it’s just what lurks in the depths, the potential of the lochs to give up something rather special, yes membership of the club is indeed an attractive proposition! If you want to join the club please apply via our website and not through Facebook (all Facebook mails go straight to trash!) and be aware that applications are processed in January. Thanks to Mr Xxxxx our records are incomplete but I have managed to compile a list from 2015 and now have a membership card template. I will be asking all members who joined this year to update me with details so our database will soon be complete! We recently put a new lock on the boathouse to upgrade the security status and we mentioned that it costs us £5.00 per key cut at the local Timpson store in Galashiels. One of our members Stuart phoned me midweek to say that his mate had a locksmithing business and he could cut keys for us considerably cheaper! That’s what being a member means helping the club out whenever possible, so thank you Stuart this is a most useful contact! Yet another of our members who knows the importance of assisting the club and is keen to help! Speaking with 3 visiting anglers yesterday one of them mentioned the Labour party and how he had been a lifelong Labour voter. More surprising was the fact that all four of us had been lifelong Labour voters, but absolutely astonishing was that all present had now switched to the SNP and viewed independence as a priority goal! Of course extrapolating our discussion on the bank shows how dramatic the shift away from Labour has been allowing the unthinkable, the Tories in second place in Scotland! The election of Jeremy Corbyn as party leader has done for the party good and proper! The parliamentary MPs are split with more backing Owen Smith but many more members are backing Jeremy Corbyn! Corbyn is of course a radical left winger reminiscent of Wedgwood Benn and Michael Foot and whilst many of his goals are laudable the policies he would like to implement to get there are less so. Smith is much more towards the centre but appeals to the new age radical as opposed to the Corbyn voting ban the bomb types. the goal for Labour must be to become electable because under Corbyn they are most definitely not! The result is inevitable and it is that the Labour party will split into two smaller party’s leaning left and ultra left! That of course leaves England, Wales and Northern Ireland with a Tory government in perpetuity! The very thought of that sends shivers down the spine but hopefully by then us Scots will be well out of the UK! I suppose the left party’s could join in coalition but from what is happening in Labour at present it does not look feasible! The more likely outcome is that the two factions will continue to bicker amongst themselves and leave the inept Tories to continue to dismantle the infrastructure of our country. This is all very well but what about the working classes left to flounder under the Tories what hope is there for them! For at least a generation there is no hope, again the working classes will be subjugated transported back to Victorian times! The once proud defender of the working classes will be no more, the party which gave us the welfare state and the NHS consigned to perpetual oblivion! It is ever so sad that it should end like this, only Jeremy Corbyn can change the outcome – he needs to resign and do it quickly for the sake of every man woman and child who are currently destined to suffer under the incompetent Tories!